December 7th is the Feast of St. Ambrose of Milan (339-397), born in Trier in a Roman Senatorial family, he was raised for public service as a lawyer and civil administrator. After he stopped an ugly street fight between Arian and Orthodox Christians arguing about who should succeed the recently deceased bishop, a child called out “Ambrose for Bishop!” The warring factions agreed and, although Ambrose had yet to be baptized, he was ordained bishop within a week. He distributed his personal wealth to the poor and his estates to the Patriarch of Milan, devoted himself to the study of Scripture, and used his considerable rhetorical skills in writing sermons and in the composition of some of the earliest Christian hymn texts that survive. He challenged imperial power and excommunicated Theodosius I for war crimes–reinstating him only after due penance. He died on Holy Saturday in 397 but his feast on December 7th is the anniversary of his ordination. All may sing or alternate the verses of Veni Redemptor Gentium composed by St. Ambrose. Which so befits your grandeur And sanctifies the earth. A virgin was your mother, O holy mystery! Let all creation marvel At that nativity. And she brought forth Salvation To all who have believed. You came to bring to captives Redemption from on high. You blessed our human nature, Becoming Son of Man. May sanctify our nature Which you have made your own. The Chant for this rendition, DAY OF SPLENDOR , is by Columba Kelly, OSB. This translation is by Dominican Friar Frank C. Quinn. O.P. (1932-2008). See the Morning Hymn for Morning Prayer Sunday Advent I for Martin Luther’s melody for his German translation of this hymn. Laudate Dominum, Laudate Dominum, omnes gentes, alleluia. Please sing this refrain repeatedly as the cantor adds the verses over the refrain/ostinato. Strong is God’s love and mercy, always faithful forever Alleluia! Alleluia, Alleluia! Let everything living now praise Adonai! and this one will delight in reverence and love for Adonai. R. In a time of favor I answer you * on the day of salvation I help you. V. I say to the prisoners: come out! To those in darkness: show yourselves! . * on the day of salvation I help you. The Gospel Canticle is preceded and followed by an antiphon based on the feast celebrated that day. Zion, fear not! Behold, your God is coming alleluia! ~Come and save us in the present age. ~ Come and save the work of your hands. ~Come and save us from the bonds of the grave. ~Come and give fresh life to a world in decay. 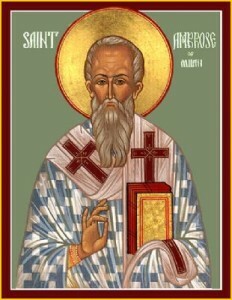 You made Saint Ambrose an outstanding teacher and gave him the courage of an apostle. May the Word of God, full of grace and truth, + bless us and keep us. ~Amen.